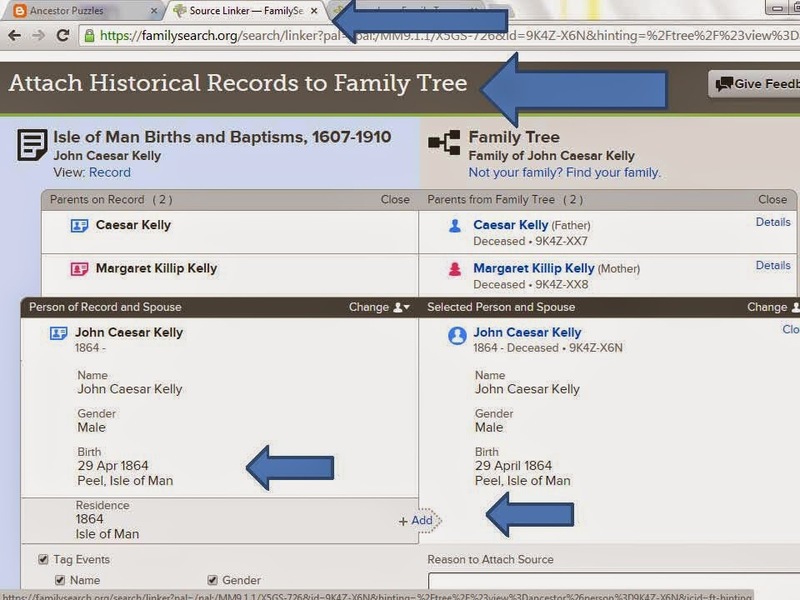 If you are not using the Family Tree at FamilySearch.org, it is time to start. Have you checked lately to see if your ancestors are in the FS Family Tree? It is time to do it. 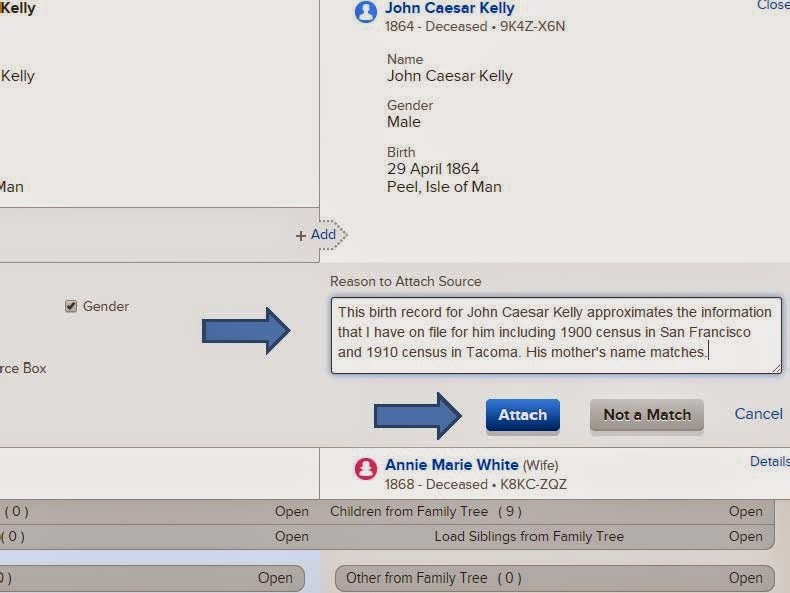 Once you decide if the record matches your ancestor you click on “Review and Attach” and you move to the “Source Linker” tab which is also entitled “Attach Historical Records to Family Tree”. 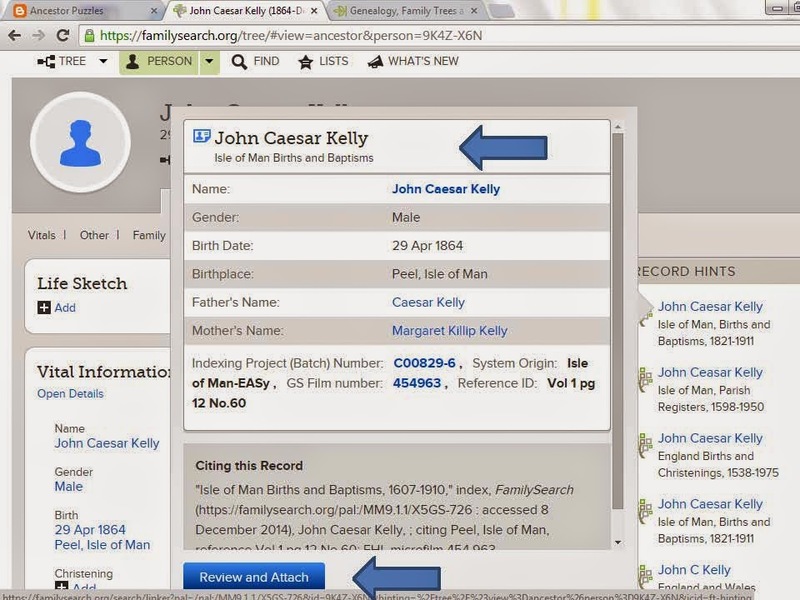 In this example you can see that the birth date for John Caesar Kelly matches what I had on his “Person Profile” page. One downfall for Family Search is that it does not give you the option to insert the better date or location into the Person Profile as you attach the Historical Record. It does give an option here to add a “Residence” fact to the Person Profile. The next step is to add a “Reason to Attach Source”. By adding a reason here you will help other viewers and editors of this Person Profile to understand why the record was attached. My reason for attaching this birth record was that: This birth record for John Caesar Kelly approximates the information that I have on file for him including 1900 census in San Francisco and 1910 census in Tacoma. His mother's name matches the oral history that I received from Grandpa George Kelly. 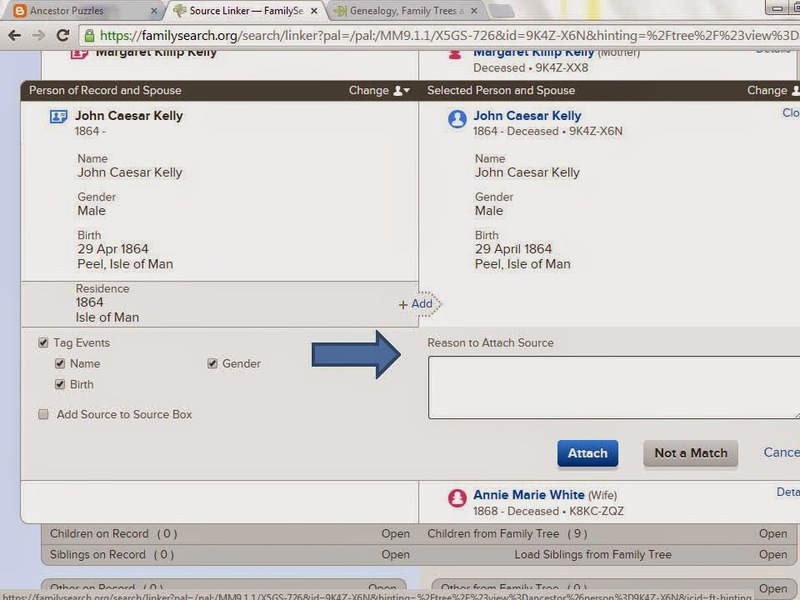 You will notice that Family Search is creating Person Profiles from their digitized databases. These Person Profiles will need to be edited to add information that you have on your ancestors. You will also need to merge those Person Profiles with “Possible Duplicates” on the lower right hand margin of the Person Profile. WARNING: you need to know that Family Tree at FamilySearch.org is a collaborative tree. The idea is that each ancestor should only have one profile. If there are duplicate profiles you are supposed to merge them together. FamilySearch offers the following advice: "Merging is a complex process in which you decide if two people are the same person. If they are, you choose which information should be kept. Please take the time necessary to carefully review each possible duplicate." I would add that if you are not absolutely sure that you have an exact match DO NOT MERGE THEM. It is a complicated process to split a merge. 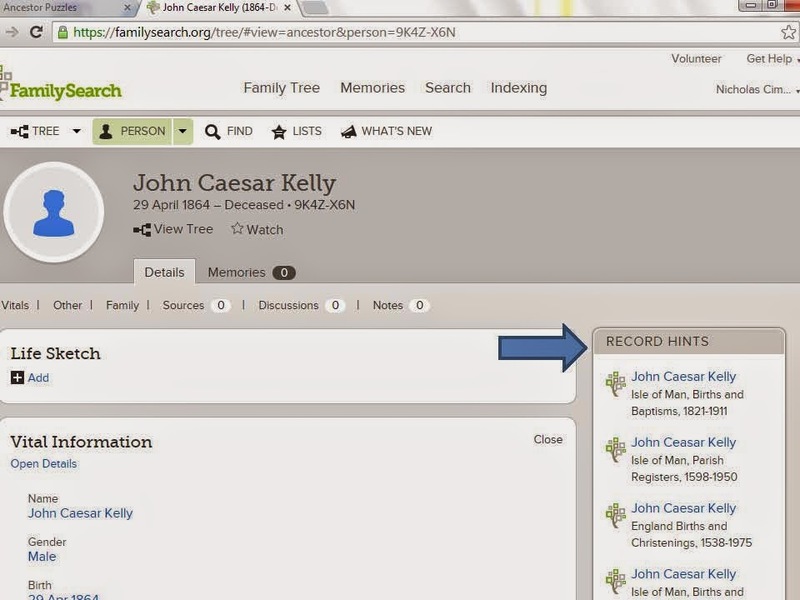 I do encourage you to start using the Family Tree at FamilySearch.org. It is a great new FREE resource that is continually improving with new innovations.